We login to emails, file shares, VPN’s, CRM’s, HR services, online productivity tools, communication applications, travel sites etc. all this with a wide range of credentials. You use an email in one scenario, an AD username in another, a username you had to pick on your own and the complexity for us humans to handle that is exponential. We need to get in to the services in order be productive at our job and the “work around” is to have the same passwords on several if not all logins. This is a well exploited security hole in security frameworks and it is a constant headache for both IT personnel and end users. Clavister provides a solution that removes the task of the end user and empowers them to focus on the job they are hired to do. 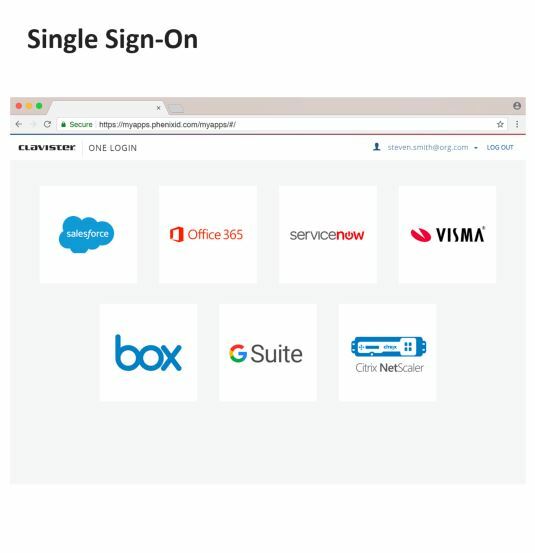 By creating a federation between all company related applications and accounts in the background the end user experience is set to have one set of login credentials to remember. This is done with federation protocols that utilize existing user-stores and databases handle everything in an automated fashion. When providing the “keys to the kingdom”, access to all your apps it is a minimum requirement to have easy to use multi factor authentication when proving who you are entering the portal. With this solution in place the workforce increase their productivity and use the full potential of their IT tools. The user experience will have a profound overhaul and connecting old and new applications to a single point of entry. On top of this the security posture of organisation removing one of the most common breach points.